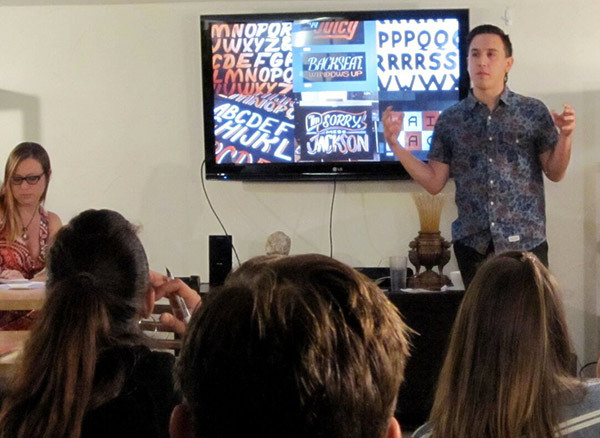 Dan Garza gave us some great insight into his process and inspirations at the last BUZZ meeting, as well as “lessons learned” in his ongoing pursuit of typography perfection. From early inspirations like Joshua Smith (@hydro 74) to Aaron Horkey, Dan showed us how he pulled inspiration from their styles and began to practice the art of typography in earnest. As his resources and skills grew, and the Instagram culture began to be everyone’s “portfolio”, he realized there was a lot out there to be influenced by – both good and bad. More recent influences and names to look for in the typography world include Jake Weidmann, Dana Tanamachi (recent speaker at a Colorado AIGA speaker series), Jessica Hische, Sean McCabe and a whole slew of others. Dan’s work has recently been featured on Jimmy Fallon in the form of Nathaniel Rateliff & the Night Sweats logo (nice job! ), and he’s done projects for several other notable musicians and companies. He encourages typographers to get back to pen and paper: practice, study, refine, and search for their personal style. From what we saw, Dan is well on his way to doing just that. Thanks Dan, for your inspiring story! Daniel Evan Garza is a Denver based graphic-designer-turned-typographer. Daniel fell in love with design and type during his co-ownership of A SMALL PRINT SHOP, Denver screen printing press, and mainstay in Denver’s RINO district. Daniel designs daily with CONSUME AND CREATE while happily freelancing type projects after-hours. In the last few years, Daniel has worked with Denver’s own THE LUMINEERS, NATHANIEL RATELIFF AND THE NIGHT SWEATS, GREGORY ALAN ISAKOV, TEDXMILEHIGH, FINNS MANOR, and CORVUS COFFEE, and is daily working to continue the trade of hand-made, expressive lettering in Denver. Now pursuing a full-time career in design, Daniel has shifted his focus to identity projects and logotypes for brands and bands he is passionate about. Daniel cares deeply for methods and styles deeply rooted in early americana, legacy of self, and anti-mechanism. Inspired by rituals, rhythms, culture, and traditional methods of early type, Daniel seeks to return craft and care to an easily-mechanized and often over-saturated market.